I love statement pieces, whether these are shoes, necklaces (obviously) or bags. Statement bags don’t have to be expensive to be striking - sometimes the right high-street bag might be as impressive. This Valentino-inspired Zara bag is one of my favourite ones ever. 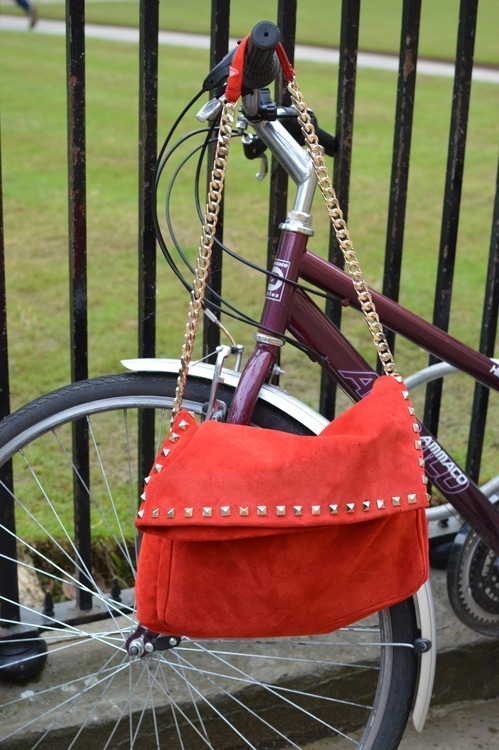 The softness of the red suede material juxtaposed with the rockiness of the studs does the trick! TIP: Even if you do sport a statement piece don’t be afraid to experiment with the rest of your outfit. Have fun with mixing textures and prints using your imagination. Bag: Zara (here or here in black), Leather pants: Topshop, T-shirt: Asos, Sweater: H&M, Blazer: Asos, Faux fur scarf: Asos, Flats: Zara, Rings: Asos & vintage gold rings.